Virgil was interviewed last years for an edition of Agenda Magazine. The topic is his latest album, The Dawn of Time and yo ucan click to read the interview here. Once again, Virgil is nominated in the Modern Drummer Readers Poll. You can find his name in the progressive category and vote for him there. Here’s a track from the ‘Beyond Turbines’ project that Virgil played on. The nice people at Remo provided this video of Virgil performing Rhythm Zero off of ‘In This Life’. And composer Alastair Taylor once again put together a track on top of an existing solo Virgil did a while back. Here’s a taste of IceFish live. It’s the title track from the album Human Hardware. Here you can listen to episode 16 of the Drumchannel podcast, featuring Virgil. Today is Virgil's 60th birthday. It means that Virgil has more than 57-years of unbelievable dedication to drumming and music under his belt, and for that, he is certainly worth celebrating. Virgil's relentless pursuit to better himself is an inspiration to everyone who has ever worked with him, or witnessed his artistic output. As a composer, he is artistically un-compromised and as a drummer he is a unique specimen, capable of things most people find impossible. I hope you will join me alongside Travis Orbin, Marco Minnemann, (with Bryan Beller and Guthrie Govan) Thomas Lang, Dave Weckl and Vinnie Colaiuta, in wishing Virgil a very happy birthday. 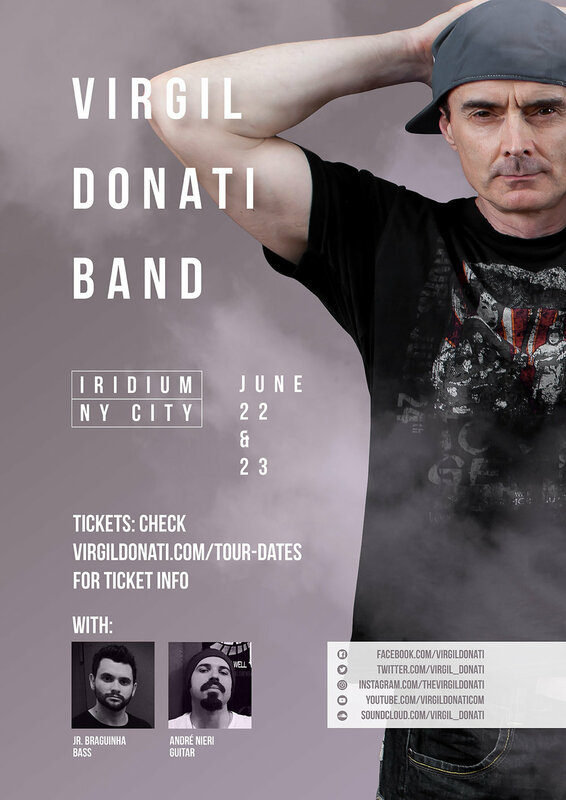 Virgil has already teamed up with his IceFish Band mates and kicked off their autumn tour of this year. For more details and updates, visit the IceFish Facebook Page. The dates for Virgil's upcoming French Revolution Tour have been updated with ticket information. Head on over to the tour dates and secure one for yourself! AND a Meet & Greet has just been added for September 26 in Paris. Email secretariat@labaguetterie.fr for tickets to that specific event. Virgil was interviewed a while back, for Drumtalk. This interview covers a range of elements in his approach to music, his playing, and in his life. Virgil recently returned from a succesful clinic tour and he has compiled 30+ minutes of highlights from his time in Cape Town. Enjoy! Go to the Tour Dates page to get updated information about where to buy tickets for most of Virgil's shows on his French Revolution Tour coming up in September. If you have yet to buy Virgil's orchestral album 'The Dawn Of Time, you can do so, right here. Virgil is an avid fan of celebrated orchestral composers like Debussy and Brahms. Here, Virgil puts words to the work he did on his orchestral album The Dawn Of Time. On the Tour Dates Page, you'll find loads of dates for France, South Africa, Mexico, USA, Finland and China. Ticket info will be added as soon as possible. Virgil playing around with his new DW Purple Heart Kit. Head over to the tour dates section of the site to find details and ticket info on more touring action for this year.